Valuing the assets of a company’s software development presents a particular challenge within Due Diligence. The industrial area especially exhibits a unique kind of software development necessitating other criteria compared with typical business software. Without comprehensive hands-on knowledge in the development of complex and robust application software, this task is difficult to solve and runs the risk of the current status being portrayed in an unrealistic and far too positive light by the developers in charge. Since software increasingly permeates all areas of business, a competent valuation of a software’s worth and of the development team behind it, separate from the commonly used financial ratios, becomes critically more important. What is the “inherent” value of the software? How sustainable is the software’s architecture? Have the right software technologies and development tools been used? What about the quality of the accompanying processes and do they conform to the recommendations of an application lifecycle management? Are employees sufficiently trained and qualified? What investments into software maintenance is to be expected over the following years? Can the software be further developed if a few but vital members of the development team leave the company unexpectedly? Is the intellectual property of the company adequately protected? Competent assessment of your software development and from there insights into business risks. Valuation of the makeup of the software development team and review of the efficiency of the development processes employed by the team. Information regarding value, quality and sustainability of your company’s existing program code. Optionally, I can provide a catalog of measures in addition to the valuation and advise you on actually implementing these in the future. 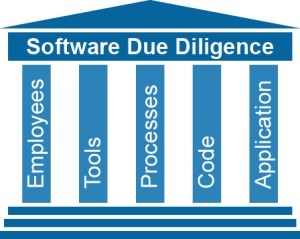 What areas are examined in the process of Software Due Diligence? Who usually places an order for Software Due Diligence? Generally, Due Diligence is typically event-driven, analysis content and focus are determined by the intended purpose. The most important application of Due Diligence is in the preparation of acquiring an enterprise. To sell a company or shares therein, or for venture capital financing, the valuation of a company is a vital prerequisite. Software Due Diligence is necessary if software development constitutes a significant part of a company’s revenue. Since the valuation of the asset “software” is not possible without appropriate expertise, economic experts draw on further specialists for specific areas in the course of Due Diligence. 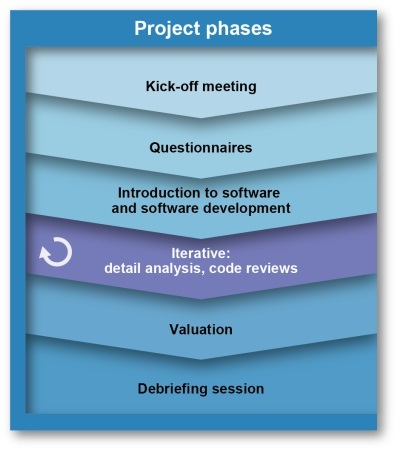 In an event-driven case, requests for Software Due Diligence are usually made by investors or banks. Due Diligence can also be performed on a voluntary basis without being event-driven. Internally, the company simulates an impending acquisition process and tests its readiness for the requirements of the M&A market. Due Diligence thus serves the company to determine its position and helps identify spots with potential for improvement with management temporarily taking the view of an external purchaser. If done at regular intervals, the data generated during the analysis about the state as-is can be used as input for creating a control system. To employ Due Diligence as an instrument of control or to check up is extremely useful. In case of voluntary valuations, these are usually commissioned by the company’s owners or the executives in charge of software development. What does Software Due Diligence contribute to determining a company’s value? For the valuation of a company, the tool of choice is the Discounted Cash Flow method (DCF). Within the computation formula, the beta factor is used to illustrate the company-specific risk in relation to the market average. A multitude of value drivers reduce the risk for an investor and accordingly the value of a company can be set at a higher value. If, during an analysis, a number of deficiencies and weaknesses are exposed, the company’s value will be reduced in relation to the need for restoration. In Software Due Diligence, the five areas: employees, tools, processes, code and application are thoroughly analyzed. 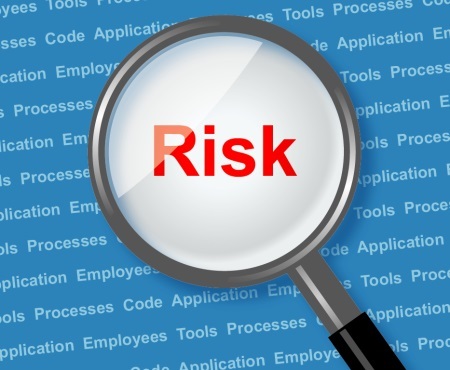 After the analysis, the expert will award a specific risk factor to each area. The individual risk factors are then used to calculate a superordinate risk factor taking into account a weighting, which then becomes part of the formal calculation as the beta factor. Thus the overall risk for the calculation of DCF is determined by the sum of the weighted individual risks. An “average risk” (= beta factor 1.0) is awarded to an average, well-run software company acting in a sustainable way and whose software and software development is generally state-of-the-art in the industry. Valuation of software and software companies is explained in detail in my book, chapter 2, “Value of Software”. How long does Software Due Diligence take? The time needed for analysis depends on the complexity of the application including the area of industry, the size of the development team, and the volume of code existing within the company. For a large team responsible for millions of lines of source code, detailed analysis takes considerably longer than for a small startup that has only been in business for 18 months and, has only a limited number of employees, with little developed code on their hard drives. More information can be found in my book “Software Due Diligence” (in German) or in the technical article “Killer-App oder Luftschloss?” (“Killer App or Pipe Dream?”, in German) (PDF, 145 KB). Members of the press interested in Software Due Diligence, please contact: pr (at) software-due-diligence.de.